In late 1987, singer/songwriters Jim Whitford (gtrs) and Don Vincent (gtrs), teamed up with rhythm section Jim Celeste (drms) and Tom Fischer (bass) to form the Pine Dogs. And in mid 1988 vocalist Gretchen Schulz joined the band. By 1989 the legendary basement tape, Jane...Stop This Crazy Thing! was released. As 1990 began, a new cassingle Give It Back/Do You Really Mean It, produced by E. Michael Brydalski, was released. The B-side included a guest appearance by Gurf Morlix, producer and guitar player for Lucinda Williams. It was this session that spawned the idea for a full length CD with Morlix producing and Brydalski assisting. 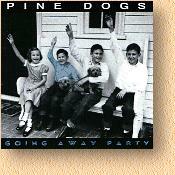 1992 yielded the Pine Dogs third release and debut CD Going Away Party. The album was recorded and mixed in 3 weeks and contained some new material and the best of their earlier songs. Going Away Party charted on college radio staions across the country an has made its way from New Zealand to Sweden. Through 1993 and 1994 the Pine Dogs toured the region supporting Going Away Party and touched down in clubs all over New York, Pennsylvania, Ohio, and Ontario Canada. In January 1995, guitarist Don Vincent announced his departure from the band. 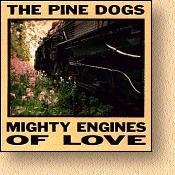 The remaining members completed the album Mighty Engines of Love which was released in October 1995. Over the years the band has enjoyed sharing the stage with the likes of the 10,000 Maniacs, Jeff Healy, Lucinda Williams, Peter Case and Crash Test Dummies. The five original Pine Dogs have performed together at a number of special events and benefits in recent years, to enthusiastic response from fans old and new. Their rare live shows are not to be missed! Copyright © 1997 - The Pinedogs - All rights reserved.